I wish they would stop doing things like this! Well, lets all thank Microsoft again for screwing up Windowblinds. The Windows 10 update to version 1809 has messed up the explorer background color in the treeview area on the left. It is being forced to white, and the only way to fixed it is to set the Windows color in SkinStudio or WB itself in the Modify Style, Change System Colors area to match the rest of the explorer area. But doing so screws up many applications that need to have a white background in order to remain functional. Microsoft Office, NotePad and many other dialogs and applications that use a white background get ruined. I sure hope this can be fixed somehow, as it has totally screwed up every single WB skin that uses an explorer color other than white. 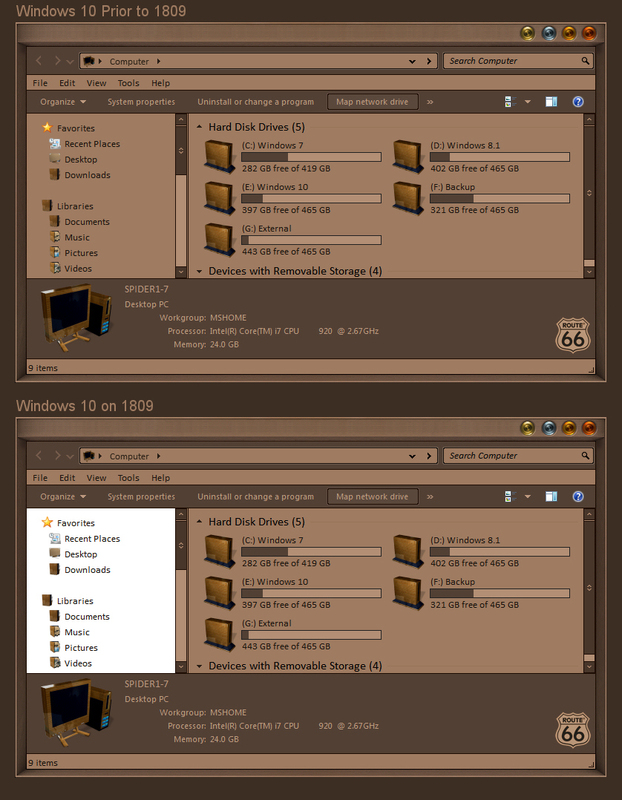 Not only that, but apparently on multiple monitor systems, 1809 oddly stretches the animations on recent start menus. The same skins work fine with 1809 on a single monitor system. Possibly this could be 1809 messing with Start10, or even WinFX. But it sure is FUBAR. I would provide a screenshot, but I have rolled back to 1803. I don't see that here Jim. My main monitor is 1920x1200 and my second one is 1920x1080. The start menu is the same size. I just noticed that I can't login in on the forums in IE but I can with Edge. I know it's not an 1809 thing, I just thought I'd mention it. I noticed the same problem Tom on my laptop, after it upgraded to Win version 1809, I was checking out my latest Master skin, Drive In, so, as Jim, I rolled back to Win version 1803, and all is good. Could be that I use a larger resolution than my monitors are designed for thru my Radeon drivers. I just know it happens on 1809 but not on 1803. Al, do you use WinFX? Yes I do. Does that have anything to do with it? Edit: I just turned it off and it didn't help. If that is what your getting at. I was asking to see if maybe my problem might be WinFX, but apparently not, since you use it too and don't have my problem. I don't have this issue on Windows Home 1809. Very odd Yrgal, it is doing it on Windows 10 Home 1809 here. Which skin are you using? If you have any of mine or anyones that has a dark background, check those please. Did a fresh install of Windowblinds and now I have the same issue on your skins only(Invader, Rhythm and others). But I do not get the white left column on Alpha Nebula Premium by adni18, Armor Tech by don5318 or Dark Mode by Vad_M. Also works fine with "older" skins like Venom & VOX by vStyler. I use light versions mostly, so that's why I didn't notice on your skins earlier, I think. The skins that are fine, Venom, VOX, etc., are OK because the Window background color is set to match the drive area background on the right like I mentioned in the original post Yrgal. But like I said, this ruins a lot of other applications that require their background to be white, like Microsoft Office, NotePad and many other applications. In order for those to look and work correctly, the Window background color must preferably be set to white. I've got the same issue guys, except I can't roll back the Windows update :/ Any fixes? Those issues will continue on the skins that do not have the Window Background color set to the same color as the Windows 10 Explorer Background colors. The ones that do work correctly do have the colors set the same. Neil has been made aware of this issue and hopefully it is being worked on. I wonder if Microsoft is deliberately trying to kill Windowblinds? You never know, but I think that would be illegal. Ok thanks, I had a feeling that might be the case. I'll just have to use another till then. Anyone know of another good black and blue theme similar to Psynaptix? Not much point in dark substyles until Neil fixes this. Bummer. OK, it has been a month and a half since the last post in this thread, and not one reply from anyone that can fix this, what the heck is going on! It was reported internally, LightStar, but not updates have been posted to it as of yet. I have updated it with your feedback. Thank you Sean. Hope it can be fixed soon.